Peter Higgins is living every chocolate lover’s dream; as President of Purdys Chocolatier, part of his role includes working with the company’s chocolate development team to test new products. “It’s a great job perk,” said Higgins, adding that he eats 6-8 pieces of chocolate a day. Purdys tests over 100 new recipes a year, 15 or so of which end up in their shops, like one of the company’s newest flavour combinations, raspberry balsamic vinegar. 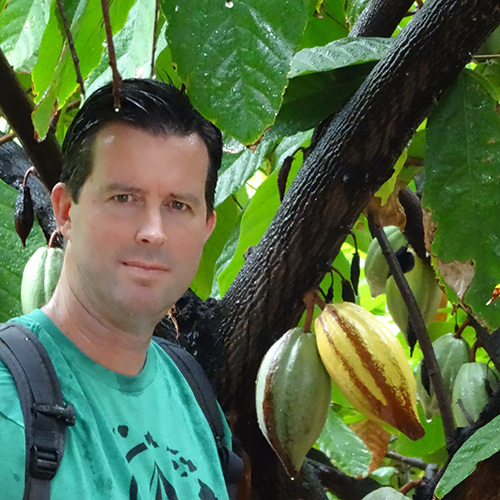 An alum of our Food Science program (‘91), Higgins joined the Canadian-owned Purdys in 1998 and has travelled all over the world to learn more about chocolate technology. As part of the company’s sustainable cocoa program, he’s visited West Africa multiple times to meet with the cocoa farmers that provide Purdys with sustainable cocoa. Purdys is also focused on making sure their employees are “chocolate connoisseurs”, able to speak on everything from cocoa farming practices right through to where the balsamic vinegar used in those special raspberry balsamic chocolates comes from (Italy). “There’s a tremendous amount of training that goes in to helping our team learn about chocolate,” Higgins said. The company’s investment in training its more than 1,000 staff, and in Higgins’ dedication to creating strong teams, has contributed to Purdys being voted as one of Canada’s Best Employers – a distinction they’ve received six times since 2002.